A holiday chart: Should you buy a new car this Christmas? It's that same familiar feeling looming in once again this Christmas--people spreading the holiday cheers, nights of delightful parties, the wonderful idea of being charitable for a change, and the occasional spoiling of one's self. Kakakilig! But for the feistiest of them vroom enthusiasts, that feeling may orbit around the hunch that purchasing a new car is the only thing that will make them Christmas-happy this year. And they're duly understood. Nothing, after all, beats the smell of a new car, followed by that of a noche buena meal's aroma. We've wanted to experience both all year. Doing so, however, is still a dilemma. Financial and priority inhibitions will always come in the way. 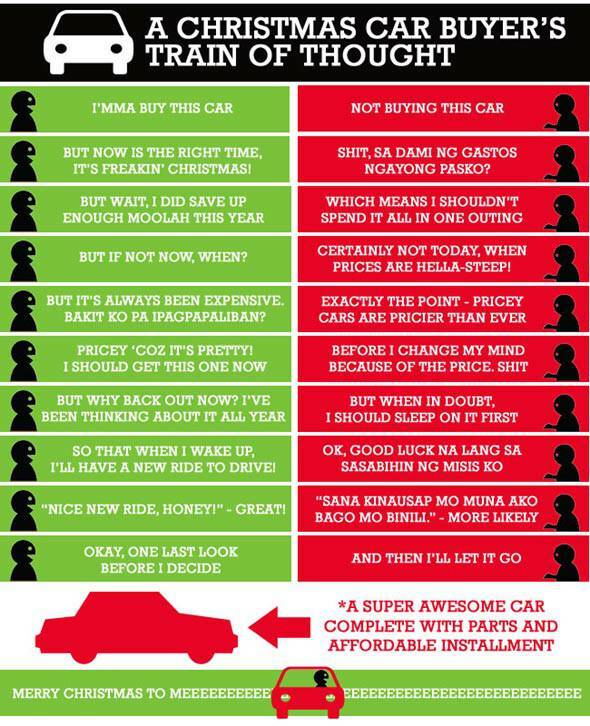 So in the midst of one's decision-making process, we went ahead and dove in just to see what a Christmas car buyer's train of thought is like. Merry Christmas!